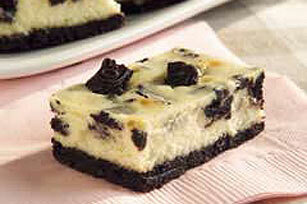 Impress friends with our easy-to-make PHILLY OREO Cheesecake Recipe! You'll love the creamy, chocolatey results of this PHILLY OREO Cheesecake Recipe. Line 13x9-inch pan with Reynolds Wrap® Aluminum Foil, with ends of foil extending over sides. Process 28 cookies in food processor until finely ground. Add butter; mix well. Press onto bottom of prepared pan. Beat cream cheese, sugar and vanilla in large bowl with mixer until blended. Add sour cream; mix well. Add eggs, 1 at a time, beating after each just until blended. Chop remaining cookies; stir 1-1/2 cups into batter. Pour over crust; top with remaining chopped cookies.